Another brew day beer! Last week Dustin and I, with the help of our friend Kyle, set out to brew a noble pilsener. While picking up a few ingredients from Marcello's on Perkins we also picked up one of the key components to brewing... some beers to drink during the process. One that surprisingly neither Dustin or I had tried before was the Latitude 48 IPA from Sam Adams. I've tried plenty of beers from the Boston Beer Company before, even a variety pack around Christmas time, but I guess their IPA had always slipped under my radar. No longer! 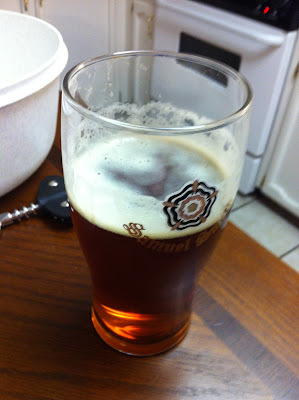 As always, proper glassware is important to enjoying a beer... this one was poured from a 12 oz. bottle into an imperial pint glass. It's an amber color, very clear with a bubbly off-white head. It's got a hoppy aroma, but not powerful. Grapefruit seems to be the dominant flavor with a little caramel note to it. There is definitely a nice malt balance on the front of the sip. The hops come through stronger at the end. It's good, with a bitter aftertaste but drinks really smooth for an IPA. A pretty good beer, but I'm not blown away. It's not up there with the Stones and Racer 5s of the IPA world, but it's definitely another good one for someone trying to get into craft beer. But then, I think a lot of what Sam Adams is about, at least as far as their flagship brews are concerned, is getting people into craft beer. Absolutely nothing wrong with that, the move converts the better!